South Africa's International Relations Minister, Maite Nkoane Mashabane, referred to President Robert Mugabe as "The crazy old man" according to a US embassy cable from Pretoria to Washington. √Ç¬∂1. (C) Having said my piece repeatedly over the last three years, I won't offer a lengthy prescription for our Zimbabwe policy. My views can be stated very simply as stay the course and prepare for change. Our policy is working and it's helping to drive change here. What is required is simply the grit, determination and focus to see this through. Then, when the changes finally come we must be ready to move quickly to help consolidate the new dispensation. √Ç¬∂2. 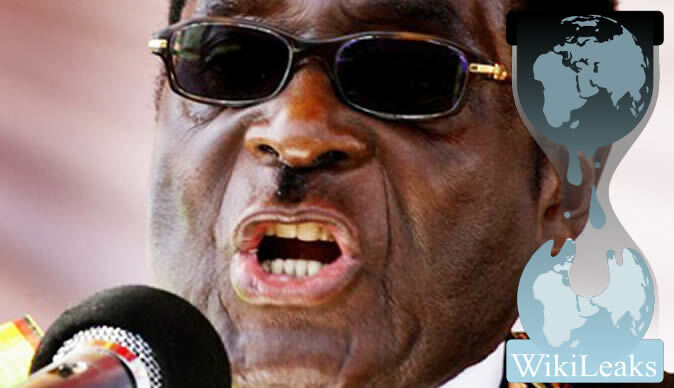 (C) Robert Mugabe has survived for so long because he is more clever and more ruthless than any other politician in Zimbabwe. To give the devil his due, he is a brilliant tactitian and has long thrived on his ability to abruptly change the rules of the game, radicalize the political dynamic and force everyone else to react to his agenda. his ego and belief in his own infallibility; his obsessive focus on the past as a justification for everything in the present and future; his deep ignorance on economic issues (coupled with the belief that his 18 doctorates give him the authority to suspend the laws of economics, including supply and demand); and his essentially short-term, tactical style." But the South African government on Monday refused to comment on the publication of documents by whistleblower website WikiLeaks. United States Diplomatic Mission press attach√É¬© and spokesperson, Elizabeth Kennedy Trudeau, said that the publication could endanger human rights activists in oppressive regimes. "What is being released released could harm dissidents or journalists and human rights activists operating in countries with oppressive regimes. It's putting lives at risk," she told Business Day. "It will complicate global engagement around the world and harm individuals who spoke to the embassy believing the conversation would be private and confidential." "What you've got to understand is that the diplomatic notes are not official positions. They're merely quick missives and come from a host of different sources including media summaries," said Kennedy Trudeau. "A layer of world diplomatic privacy is gone," she said. Libya's President Muammar Gaddafi allegedly never travels without a Ukrainian nurse described as a "voluptuous blond". A source told the US embassy in Tripoli that the 38-year-old Galyna Kolotnytska was the only one of a team of four Ukrainian nurses who knew the Libyan leader's "routine", according to a cable from the embassy posted on the New York Times website. U.S. diplomatic cables released by online whistle-blower Wikileaks include remarks from an Iran source in 2009 saying Supreme Leader Ayatollah Ali Khamenei has terminal cancer, French daily Le Monde reported. Israel is trying to prod a sometimes sceptical Washington into tougher action ' such as sanctions, subversion, and even a military strike by 2011 ' against Tehran. But the documents also described Saudi Arabia urging the Americans to "cut off the head of the snake" by attacking Iran, a hawkishness echoed by other Arab leaders, and outline suspicions that North Korean missiles may have given the Iranians the range to reach western Europe and beyond. Iran obtained 19 advanced missiles from North Korea, potentially giving the Islamic nation the capability of attacking Moscow and cities in Western Europe. President Hamid Karzai's controversial younger brother painted as a corrupt drugs baron, exposing deep US concerns about graft undermining the war against the Afghan Taliban. Ahmed Wali Karzai has long been dogged by allegations of unsavoury links to Afghanistan's lucrative opium trade and private security firms. US diplomats have cast doubts on the reliability of NATO ally Turkey, portraying its leadership as divided and permeated by Islamists, according to the German Der Spiegel magazine's website. Advisers to Prime Minister Tayyip Erdogan were described as having "little understanding of politics beyond Ankara". The first batch of leaked cables showed how Mandela was shot down by his African National Congress (ANC) party when he expressed a desire to meet ex-British prime minister Margaret Thatcher shortly after his release from prison in 1990. Mandela had wanted to explain why the ANC had opposed Thatcher's policy of "constructive engagement" with the racist apartheid regime but the leftist ANC opposed the meeting, leaving Mandela "furious." The cables also contained embarrassing revelations about how both South Africa and the US view Zimbabwe's leaders. Russia's Vladimir Putin emerges from the biggest ever leak of US diplomatic documents as the "alpha-dog" ruler of a deeply corrupt state dominated by its security forces. The 58-year-old prime minister is presented by US diplomats as Russia's most powerful politician, holding the keys to everything from energy deals to Moscow's Iran policy. By contrast, President Dmitry Medvedev "plays Robin to Putin's Batman", is pale and hesitant and has to get his decisions approved by Putin, according to the cables.